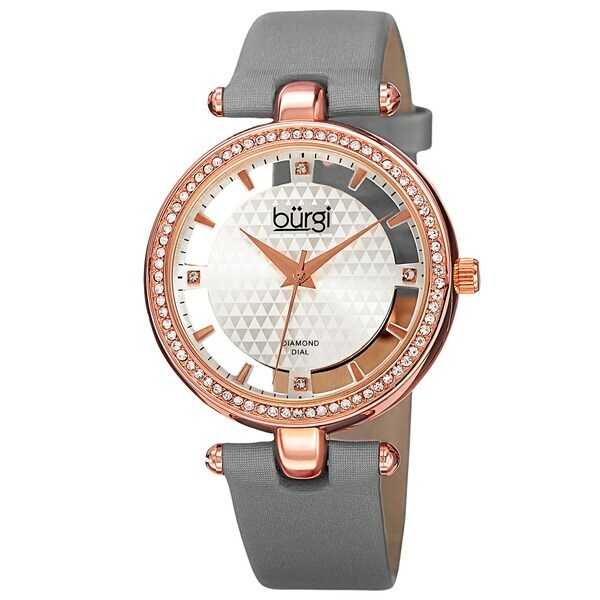 Adorn your wrist in class and style with this ladies Burgi watch. It features a transparent dial and four genuine diamond markers. This watch is easily paired with your pick of earrings, ring or any jewelry. With a row of genuine crystals around the bezel and a satin strap, this watch is sure to dress up any outfit. Burgi watches are a brand I enjoy owning and I do have several, all are beautiful. My new watch pictured above no doubt is the neatest, and the most versatile in what it can be worn with then all my other beautiful Burgi's. I like the see through face, and the satin feel of the band. It is nice to have and wear, and it is that simple. I have worn it every day since I received it before Christmas. I had planned on purchasing a watch with numbers on the face, but this watch caught my eye and I never noticed even after I had worn it several times that the numbers 1-12 written on the face are not there. That is okay and I highly recommend this smooth looking dress up or down watch. Buy one and see just what I mean. Beautiful watch, genuine leather strap. This attractive watch is eye catching as well as functional. The large face makes telling time extremely easy and the wide band keeps it securely on the wrist. I would highly recommend this watch to others. I needed an everyday watch and this is the perfect one - with its see through face and its “oh so comfortable” satin strap. I got the cream bracelet which goes with almost everything. Wanting to order the red one. I highly recommend this Burgi watch- high style, classy and great quality. Beautiful and very unique. I was so pleased that this watch looks and feels and is packaged as a very expensive watch,.,,far more than I actually paid for it, I LOVE iT!! This was a great buy and I will look for more Burgi items at Overstock. It is a very expensive quality watch at a great price! Looks very elegant. Great quality too. This face is a little big, but okay as a casual, fun, summer watch. I say 'summer' because it has a white band. Comfortable, adjustable band. Stunning watch! Classy with a bling, yet modern and suitable for any style! Love the large dial body and the skeleton design. The strap is stylish and easy to adjust as well. It is definitely a watch to make a statement! Comes in a nice brand name box with all the repair or service instructions. 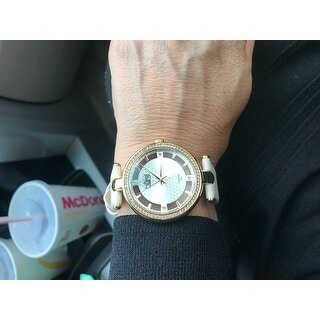 lov e this watch! it's casual dressy . easy to read & looks good no matter what your wearing. I am thinking on ordering another one in a different colored strap. also really liked the free bangle bracelet that came with it! I get lots of compliments when I wear this watch and every one wants to know where I got it! . Great quality product however unexpectedly large. Would have been very elegant if it were 1.5 to 2 times smaller. Bought this for the wife and she just loves it that I had to get another one in a different color." Happy Wife , Happy Life " and yes I would recommend this to everybody !!!! I was very pleased with this product upon arrival. I had been a bit leary that the size would be too large but it was tasteful and classy in appearance. Can dress up or down with it. Unfortunately, the watch was way too big for my wrist and I had to return it. It looked nice but not completely what I was expecting if it would have fit. Love it, wear it everyday!! I purchased the watch with the red band and it's just beautiful! The red is the kind of red that looks great with reds AND pinks. The satin finish is also lovely! The timepiece keeps time perfectly and the hands are big enough for me to see! So glad I purchased this watch! Nice Watch! I got this for my wife for Christmas. She loves it. I liked the look of it. Very elegant and classy. This looks like a simple, elegant yet beautiful watch. I am looking forward to receiving this and giving it as a gift.